The website Metro.co.uk just started a weekly series called “I’m Your Biggest Fan” in which they speak to superfans of various things. They have profiled someone who lives like a Barbie doll, and someone who is a huge fan of Harry Styles. This week, the subject matter is Juggalos. They spoke with our homie Sez2Dope about what drew her to the Juggalo scene, what the Hatchetman means, why she paints her face, and what being a Juggalo means to her. It’s a quick read, and she does a good job shining a positive light on us. You can read the interview below. Welcome to Metro.co.uk’s super fun new series, I’m Your Biggest Fan. This week we’re speaking with Sez Too-Dope, who has dedicated her life to the music and symbolism of US hip hop duo Insane Clown Posse. 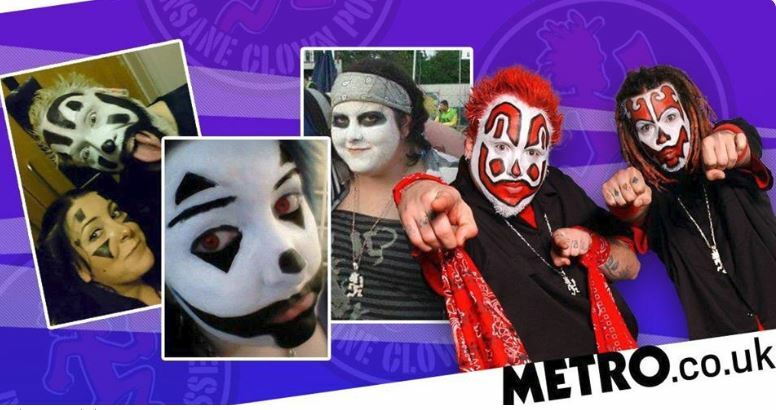 They have an infamous presence in the United States, with its fanbase calling themselves juggalos/juggalettes, painting their faces in the some-would-say intimidating, yet telltale paint introduced by the band’s two rappers Violent J and Shaggy 2 Dope (which is where Sez got her moniker inspiration), and tattooing the symbol of Psychopathic Records, ICP’s record label, the Hatchetman, on their body – of which Sez has done three times. Juggalos/lettes, to the uneducated, look like a fearsome bunch, but Sez wants the masses to know they’re more hippies than anything else – and speaking for the UK branch, of which she organises the yearly Juggalo Weekend, aren’t the violent outcasts they’ve at times been painted (for want of a better word). So, let us get this straight: we have juggalos…and juggalettes? We call them ‘lettes for short, but, even though I’m female, if someone asked me I’d probably say I was a juggalo. Supporters of ICP have been associated with violence in the past. Do you feel there is a misconception about what being a juggalo means? We’re hippies, more than anything. It’s about love, as corny as that may sound. None of us juggalos are the same. Some look and act the same, but we’re all different races, sexualities, classes. Some people might be brought up in a really posh place and some might not have – we don’t judge and that’s the main thing. We hate racists and homophobes – we don’t accept that in the group. To be fair, most people don’t actually know what juggalos are and we get a lot of bad press. We might come across as intimidating, wearing facepaint and listening to horrorcore, but when people actually speak to us, the amount of feedback I’ve had is that people are surprised and people look to us and everyone wants to know what it’s about to understand why we have this dedication. What first got you interested in Insane Clown Posse? When I first listened to ICP I’d never heard anything like it before. I was at a party and the Great Milenko album was on and I was like, ‘These are really good!’ I forgot about them for a couple months, but then I lost my sister and there was a sad song about heaven and I remember it got me, so I looked it up and found it and that’s when I got into them more and found out about the juggalo thing. And you paint your face all the time? I haven’t painted my face in a while but that’s more because I’m lazy [laughs]. A lot of the juggalos do and sometimes I’ll put the white bit on but can’t be bothered with the rest. With the facepaint my friends think I’m crazy. Or they’ll ask about the Hatchet man tattoo, which I’ll explain to them, it’s just basically a record label symbol but it’s a symbol for the juggalos. Most people can’t understand it, basically. But everything has meaning behind it; the songs have meaning. People see ICP as something spiritual, especially the US juggalos. We’re all together, we’re the ones who didn’t fit in, the rejects cast aside; we didn’t fit into any group and we’ve found one that we do because that’s what we all have in common. Okay, what is the hatchet man logo so many juggalos have tattooed? Basically, it’s the logo for Psychopathic Records, which ICP are on. A lot of us have that tattooed on us – I’d say at least 70% have that tattoo. Not because everything ICP does is great, it’s more like ‘We are juggalos, this is the tattoo for us’. We already know the principles and what we’re about. I’ve had two of the tattoos, but I got them covered up, so I have another one on my ankle, in rosary beads, with the hatchet man instead of a cross. Is there a ‘uniform’ you all wear when you get together? You’ve got your stereotypical ‘lette with the dreadfalls and bright colours. We sort of look like metalheads, but you’ve also got the hip-hop heads. There is a real mixture. We might wear shirts with blood splatter on them, but that’s just how we dress. What reaction do you get when you all come together in the make up…and the blood splatter shirts? We have gone out in public and if people are nice to us, it’s fine – but we know people don’t like us that much, so we ignore people who are nasty. For those interested in the UK Juggalo Weekender event, this is the official FB event page: https://www.facebook.com/events/1039594586201406/ Juggalos from all over Europe come to this event. See ya there!